Bread is something really important for me and I like to bake it and eat it with various dishes. 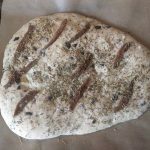 This is not coming as a surprise that I really like to bake and eat focaccia. 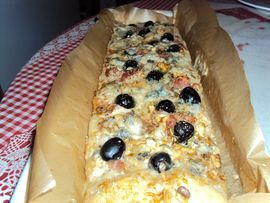 This bread with olives, mixed herbs, cheese and either bacon or anchovies is perfect for an outdoor picnic or a quick dinner along with a salad. You can also serve it as an aperitif. 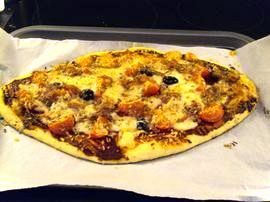 This recipe is really quick to do, if you have a bread maker, just pour all the ingredients and launch the dough program for 15 minutes, then shape the dough and let it rise somewhere warm. 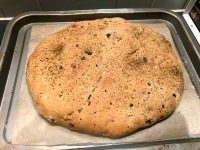 Last time, I made a bigger batch and bake 2 focaccia and froze one that is so handy when it is a crazy week and you don’t have time to cook, think… and don’t want to opt for a takeaway. 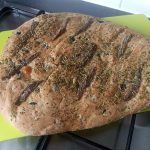 How to do a Focaccia with emmental, olives and anchovies? 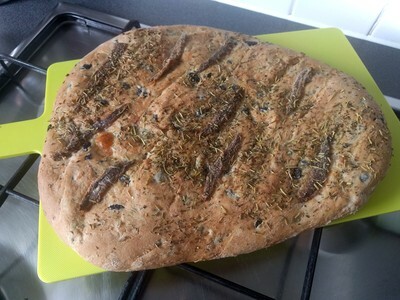 When I am doing the focaccia, I prefer to keep the anchovies for the decoration on top of the focaccia, but you can also put some on the dough, it is a question of taste. Don’t forget that the anchovies are pretty salty.